Charitable organizations often encounter barriers to success due to lack of transparency, accountability issues, and limits to the ways they can accept donations. 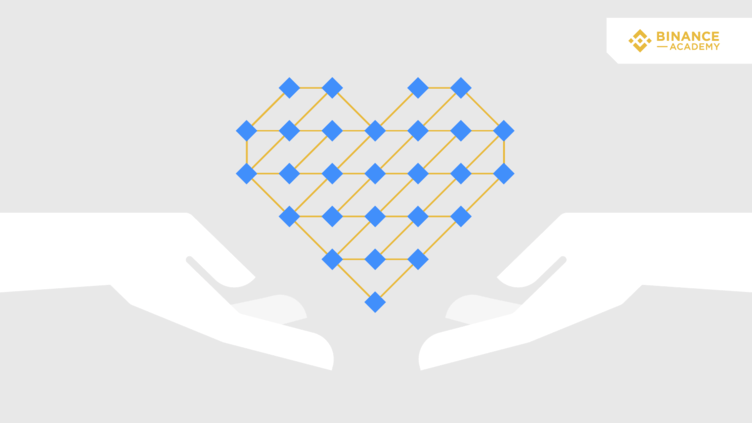 Crypto-philanthropy (or the use of blockchain technology to facilitate charitable contributions) offers an alternative solution, with decentralized and direct transactions that may help these organizations receive donations and raise funds more efficiently. The creation of blockchain systems brought up many benefits in a variety of industries, as they allow for increased transparency and data security. Although the concept existed long before the creation of Bitcoin, it was only recently that blockchain’s potential started to be acknowledged on a broader scale. Blockchain is a fundamental component of nearly all cryptocurrency economic networks. It was formerly devised by Satoshi Nakamoto as the digital ledger behind Bitcoin, but the technology has since been applied to a variety of other scenarios and has proven to be quite useful not only for digital currencies but for many other types of digital communication and data sharing. The Bitcoin blockchain operates as a distributed ledger technology (DLT), which is protected by cryptography and maintained by a huge network of computers (nodes). Such a framework allows for peer-to-peer (P2P) borderless transactions within a trustless environment. Trustless means there is no need for users to trust each other because all participating nodes are required to follow a predefined set of rules (outlined by the Bitcoin protocol). The Bitcoin ledger used for these transactions does not reside on any single data center or server. Instead, the blockchain is distributed and replicated across a myriad of computer nodes, spread around the world. This means that every time a transaction is confirmed or data is changed, each participant has to update its own version of the blockchain, in accordance with those events (they have to reach consensus in regards to every change). As mentioned, blockchain is often used as a distributed ledger, and the advantages provided by this unique technology are serving several philanthropy organizations and charity foundations. The Binance Blockchain Charity Foundation (BCF) is one notable example. There is still a long way to go until cryptocurrencies get globally adopted, and this route is particularly longer when it comes to charity. Currently, there is a small but growing number of charitable organizations that have already embraced cryptocurrency as a donation method. Donors that intend to use cryptocurrency to make their contributions may have to either confine their efforts to the few organizations that support them or donate large enough amounts as an attempt to persuade their favorite charities into accepting crypto payments. Before a charity starts receiving cryptocurrency donations, it needs to have a process in place for managing and distributing the funds in a transparent and efficient way. Understanding the basics of cryptocurrencies and blockchain technology - and how the donations can be converted into fiat currency - is crucial for an effective implementation strategy. Total transparency: each cryptocurrency transaction is unique, which means that it is also easily tracked through the blockchain. The higher level of transparency and public accountability can ease donors' minds and encourage them to give while also reinforcing the charity's reputation for integrity. Global and decentralized: most blockchain networks present high levels of decentralization, meaning that they do not need to rely on a centralized government or other institution. Thus, funds can move directly from donors to charities, and the decentralized nature of blockchain makes it uniquely suitable for international transactions. Digital agreements: blockchain makes it easier to share and store digital data, and may also be used to ensure that important documents or contracts cannot be modified without the approval of all involved members. Reduced expenses: blockchain technology has the potential to simplify the way charities are managed, automating parts of the process and reducing the overall costs by requiring fewer intermediaries. Reduced taxes: considering a US-based donor as an example, if a contribution is made with Bitcoin, the charity will get the full donated value (no capital gain taxes). Moreover, the donor would be able to claim a higher tax deduction towards governmental agencies. Volatility: besides stablecoins, most cryptocurrencies are being traded on highly volatile markets, and often suffer large swings in value. Security: if the private keys that give access to donated funds are lost, there is no way to recover them. Likewise, if the keys are not managed and secured properly, a malicious entity may end up accessing the wallets and stealing the funds. Public awareness and understanding: most people find blockchain quite difficult to explain, and many potential donors don’t understand the basics of cryptocurrencies well enough to trust the system or make use of it for charitable donations. Crypto-philanthropy has been taken up by some high-profile charitable organizations in recent years. In 2017, for example, the global philanthropic organization Fidelity Charitable received the equivalent of $69 million in cryptocurrency donations. The same year, an anonymous donor known as Pine distributed around $55 million in Bitcoin donations to various organizations worldwide via the Pineapple Fund. As previously presented, the Blockchain Charity Foundation (BCF) is another notable example of crypto-philanthropy. The BCF is a not-for-profit organization aiming to transform philanthropy through the use of a decentralized charity platform. Crypto-philanthropy remains a relatively new means of giving, accepting, and distributing donations. But as the blockchain technology grows more widespread and familiar, charities and donors alike may come to embrace it as one more attractive way to help those in need. It seems only sensible to assume that as the public continues to adopt this form of giving, charitable organizations will ramp up their cryptocurrency operations.